Marbled Arts will demonstrate paper marbling process and provide a workshop. I will Introduce you the history of paper marbling and techniques, where you can try your personal marbling usiing water based paint. The workshop is taking place in the teacher’s workshop in Strada in Chianti (Firenze), Italy by means of individual education in one day of two hours lessons, in schedule agreed previously with me. 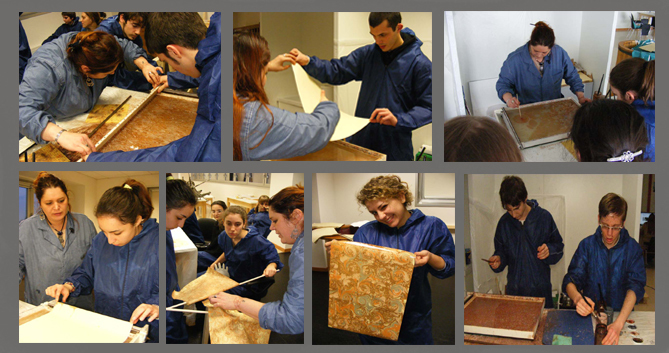 The price of the individual paper marbling introductory course is 100,00 Euros. In this price there are included all the materials to use in the course, staying of his property the papers that he/she paints, in format 50 x 70 cm. The Student will be able to take notes and make photos, only for his/her particular use.